State-level GDP data for the first quarter of 2018 showed zero growth in Arkansas, placing the state 49th among the 50 states (North Dakota experienced a decline of 0.6%). The comparable value for U.S. GDP growth in Q1 was 1.8%. Over the past four quarters Arkansas GDP expanded by 0.7%, well-below the U.S. average of 2.6%. As shown in the figure below, Arkansas growth rate has lagged the nation since at least 2014. From the beginning of 2014 through 2018:Q1, the growth rates of Arkansas and the U.S. have averaged 1.0% and 2.4%, respectively. 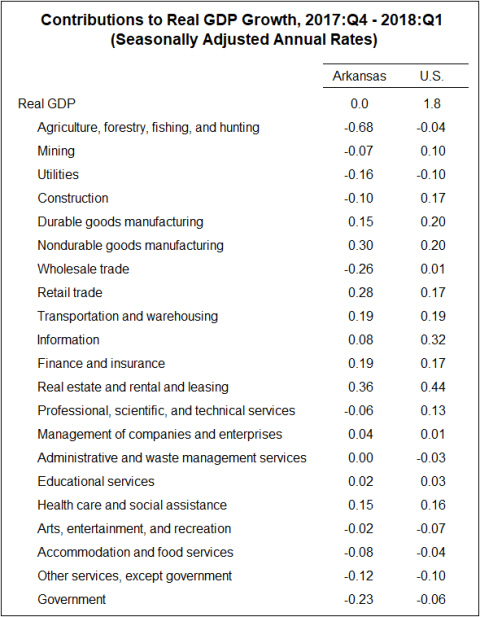 The breakdown of GDP growth by sectors shows that Arkansas’ weakness was largely attributable to the Agriculture, forestry, fishing, and hunting component, which subtracted nearly 0.7 percentage points from overall growth. Other sectors dragging down Arkansas growth included Wholesale trade and Government. Several sectors contributed positively to growth, including Manufacturing, Retail trade, Finance and Real estate, and Health Care. 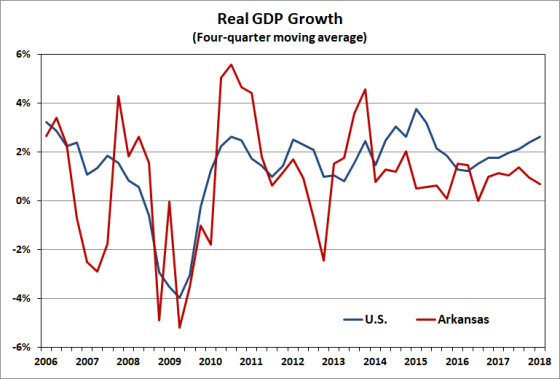 The slow growth of Arkansas GDP in recent quarters is cause for some concern, but the initial quarterly estimates are subject to considerable revision. 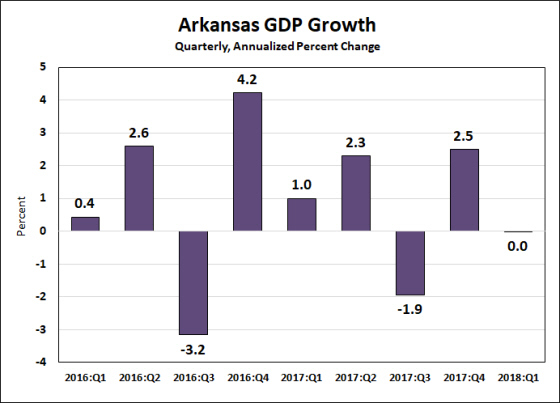 Just six months ago the data were showing Arkansas outpacing the nation with a four-quarter growth rate of 3.6% (2016:Q3-2017:Q3). The latest information show Arkansas growth rate to have been only 1.4% over that same period. Later this week (July 27) the BEA will release statistics from the latest comprehensive update for national GDP, but the state-level revisions will not be available until the next quarterly release date on November 14. 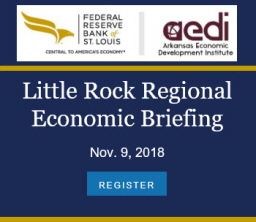 Until then, this latest release represents the best information available, and it suggests that the Arkansas economy got off to a relatively slow start in 2018.